It has become almost customary for the industry to roll out points of comparison between iOS and Android, every time either of them rolls out a new set of feature. And when the rollout is as massive as the new Operating Systems, comparative articles like these are bound to surface. Last time, when Android O and iOS 11 had come out, we drafted a similar article dissecting the best of both and coming to the conclusion in terms of which is best. Now it is that time of the year again. Carrying our tradition forward, here’s a comparative article of Android P vs iOS 12. Before we go any further with seeing which OS stands where in the iOS 12 vs Android P race, let us first look into the features that both the Operating Systems are newly introduced with. Here are the iOS 12 Features and Android P Features. With iOS 12, Apple is making your lock screen a lot clearer. Instead of seeing the notifications separately like in iOS 11 and the versions before that, you will now get them stacked together, grouped according to the type. There’s also a new option called Manage where you can choose whether you want to get the notifications silently or want them switched off altogether. iOS 12 now comes with the provision of creating a virtual avatar. Residing next to Animoji in iMessage, the new feature also uses FaceID to capture your expressions. Memojis can also be superimposed in your FaceTime call, making them a lot more fun. Apple wants you to spend less time staring at your screen. And to manage just that, the new OS version comes with a feature called ‘Screen Time’. Located as an option in Settings, it gives you a breakdown of the time you are spending on your device. Very soon you will be able to develop your very own shortcuts and build custom commands for Siri. If you say “Hey Siri, let’s go Trekking”, the voice assistant will show you the weather, places you can go for the trek, and the reminder to get your gear. Very soon you will be able to choose a suggested action and set a phrase for triggering the action. Apple will in a few days roll out the option to add over 32 people on the group FaceTime call – along with Memojis. With Android P, you can navigate your ways inside a building with its support for IEEE 802.11mc Wi-Fi protocol. The feature enables the users to access the functionality of one app outside of it. Example, when you type in Lyft in the Android P Google Search, an interactive pop-up – Slice – will come up with the choice to book a cab, eliminating the need to leave your action and opening the Lyft app. You now have the option to view the images attached in the message in the notification bar itself. Secondly, the provision of Smart Reply has been extended from Gmail to messages as well. Android P has now restricted apps that are running in the background to access the device’s mic and camera. With this, if the app tries to use your camera without your permission, it will be shown a system error and similarly, if an app uses your mic without your knowledge, will receive a blank sound. 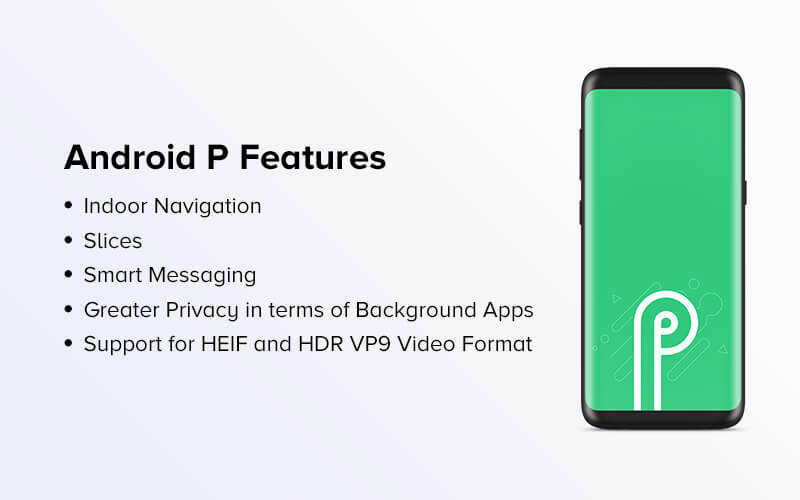 Both the file formats have been introduced with Android P to help users capture clearer and high quality video and images. So here were the new set of features that both Android P and iOS 12 have been introduced with. With that known and acknowledged, let us get into the depth of Android P and iOS 12 comparisons. Popularized by Apple in iPhone X, Google has officially embraced Gesture Navigation in Android P as well. But since Android P still comes with a Back Button, it is not a 100% gestural like iOS 12. Also, because of the device fragmentation, it is impossible for Google to roll out full navigation gesture among all its devices, which gives one point to iOS 12. The Siri update that Apple has come with in iOS 12 has powered the voice assistant to predict what you might want before you ask it. But the standards Google has set with Assistant quality is beyond comparison. With Android P, Google has embedded AI deep in the essence of Google Assistant also by adding six new voices, the tech giant has made having a conversation with a virtual mode more humane. Seeing how far Google Assistant has come with Android P, this point goes to Android P.
Apple continues to make iMessage app better. 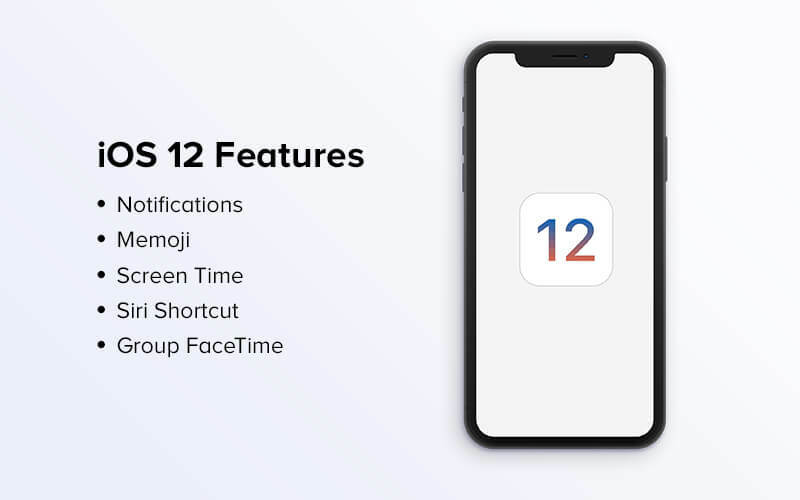 iOS 12, keeping up with the trend of innovativeness, comes with Memoji, secure peer-to-peer payments, cross-platform texting, and Wi-Fi texting etc. Google, on the other hand, has nothing special to offer on the messaging front. While Android P now brings smart reply to the notification bar, it is not enough to match the standard set by Apple and the absence of its own messaging platform, works against it as well. So, when it comes to messaging in the mix of Android P vs iOS 12, the point goes to iOS 12. While on one hand Apple in WWDC 2018 added the feature to add another face in Face ID authentication, Google, with Android P has not given any special focus to Facial recognition. Given that Apple made Face ID popular, this point goes to iOS 12. While ARKit (Apple’s AR) and ARCore (Android’s AR) both come with a similar set of features – Motion Tracking, Environment Understanding, and Light Estimation, Google with its ARCore is points ahead of ARKit. ARCore came with a range of new features in I/O 2018 such as Augmented Images, Cloud Anchors, and WebXR etc. While on the other hand, ARKit has received following updates in WWDC 18 – Shared Experience, Measure app to gauge the dimensions of real world objects, and Quick Look – a feature that allows users to place virtual objects in real space setting. 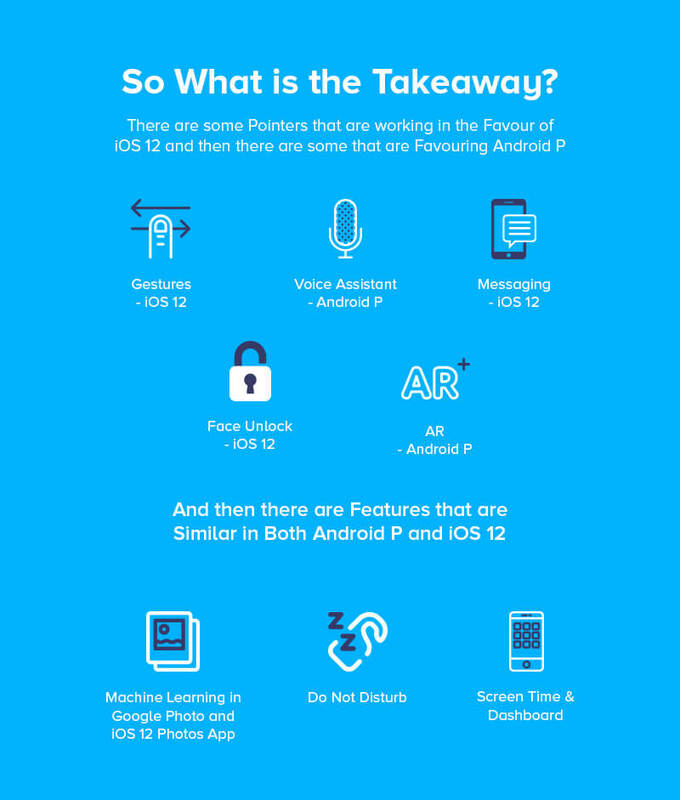 While Apple is working towards making its AR platform as robust as Google’s it is lagging behind to a great extent and solely because of that, one point for Android P vs iOS 12 goes to Android P.
So these were the points of differences between iOS 12 and Android P and what we can make from it is that there is no clear winner. While in one place iOS 12 is points ahead in the other, Android P is miles ahead. It would ultimately come down to which points matter most to you and which don’t. 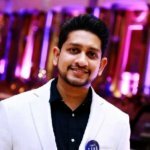 What makes it even more difficult to come to a conclusion is the fact that both the tech giants have resorted to offering similar features such as – Incorporation of Machine Learning in Google Photos and iOS 12 Photos App, Do not Disturb Mode, and similar purpose Screen Time and Dashboard features. In the end, let time come with the verdict of Android P vs iOS 12 war. Meanwhile, if you are planning to scale your app to either of these operating systems, contact our team of mobile app development experts, today.